Was für eine tolle location - wir haben jede Minute genossen! Das New Teddys liegt super - dicht am Strand und Trubel, aber weit genug weg und mit klasse Gelegenheiten, um sich auch mal zurückzuziehen... Die dorms sind super auf einem backpacking trip durch Afrika, und wir haben viele Leute kennengelernt. Essen lecker, Cocktails und Bier für die sundowner auf Terrasse, der staff war einfach nur lieb, nett und hat uns alles ermöglicht... Wir wollen ganz bald zurück nach Paje!! !Life is Paje beach! if you are looking for African paradise, come here! stayed at New Teddys for a few nights during our Zanzibar trip, and wow, loved every single minute! 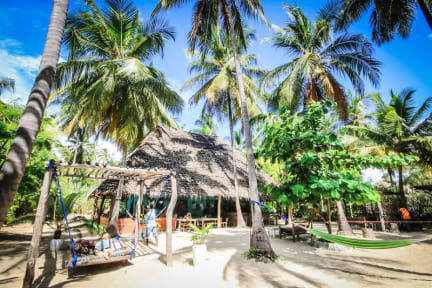 laid back atmosphere, super friendly staff, helped us with any tours and activities, food was nice and inexpensive... the beach was out of this world, and even the rains could make it any worse, the colours were spectacular! Another cool things was that we were able to use the sister property in Jambiani with pool - definitely a treat! I have to fly back home today. But I'll definitely come back to this beautiful place and stay longer.. Everything(!) was perfect! It‘s the first time I give a 10/10 on the website But this hostel truly deserves it! 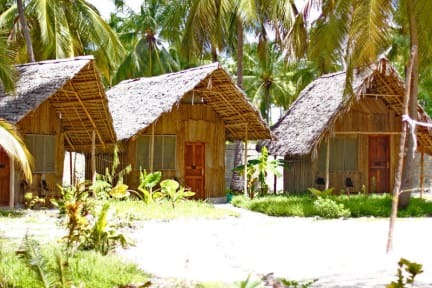 It was just amazing, the location is great right next to the beach, the atmosphere, people and the overall look of the hostel is so great, that you feel completly at home once you arrive. The staff is amazing, for my birthday they even had a cake and everybody sang. Loved every minute of my stay and would definitely recommend it to anybody! This place is like paradise! Great vibe, clean rooms, awesome chill-out area and great location super close to the beach. The staff is amazing and you can see the passion and energy Leonie puts into this place in every detail. I'll be back! Really nice place with charming staff! Very close to amazing Paje beach. Nice people, good food and drinks, great time! Superschönes Hostel mit tollem Personal. Das enthaltene Frühstück war super lecker und mit frischem Obst und Saft. Absolut empfehlenswert! Its a beautiful place! Nice private rooms next to the common bath. The main house, bar and place to relax is very cosy. The atmosphere, the people, the workers, the barkeepers are just awesome! You have 1 minute to the beach! You feel safe and thats important in this country! The only negative point is the price of the lunch or dinner! We called it "german prices", because its like the prices of german food, BUT the food was great! Thank you so much to have a great time on Zanzibar ! ++ Lage des Hostels ++ Bar und Essen Negatives I: Die Duschen sind ganz schwach und dürftig für die ansonsten tolle und angenehme Einrichtung der Hütten. Negatives II: Die Touren die man im Hostel buchen kann, haben teilweise eine Marge von über 100%, das ist einem Hostel unwürdig. Lieber direkt am Strand buchen.